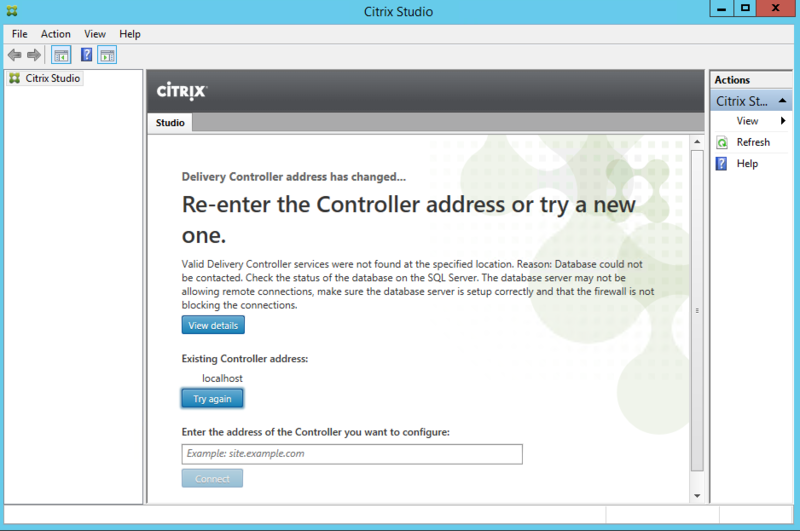 XenDesktop 7 Delivery Controller Address has Changed. Re-enter the controller address or try a new one. 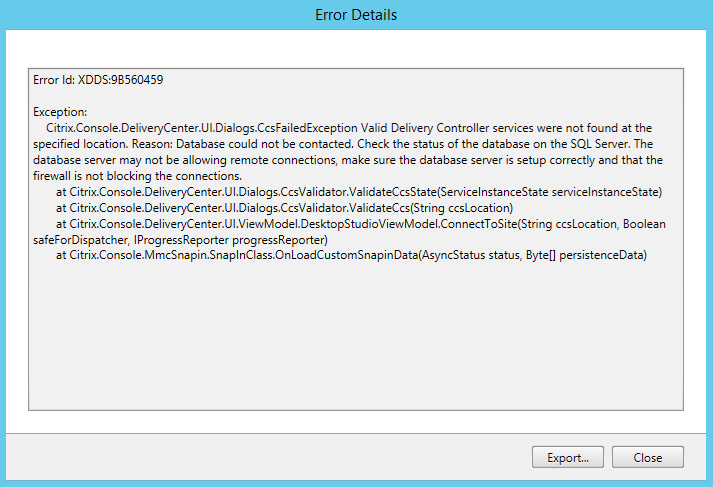 Opening Citrix XenDesktop Studio displayed the following error message. Valid Delivery Controller Services were not found at the specified location. Reason: Database could not be contracted. Check the status of the database on the SQL server. The database may not be allowing remote connections, make sure the database server is setup correctly and that the firewall is not blocking the connections. After looking at the error details, I needed to gather more information and verify the issue was not caused by a change on the XenDesktop Delivery Controllers before contacting the DBAs. 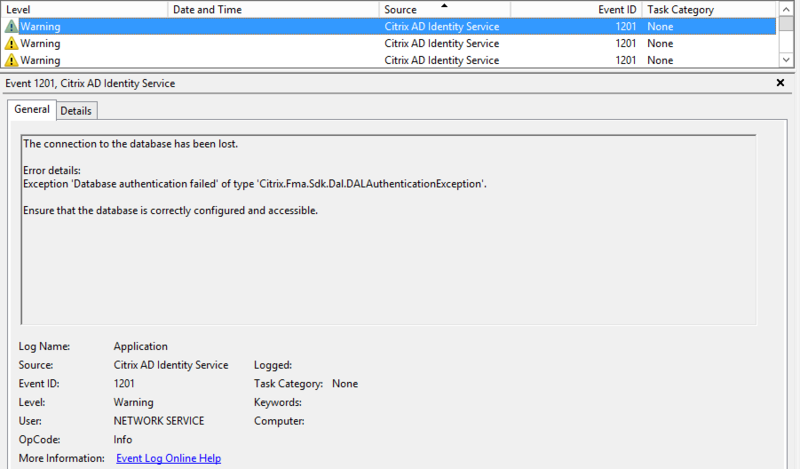 First thing I usually do is check the Event Logs and I noticed there were several 1201 events for Citrix AD Identity Service. The Connection to the database has been lost. I also tried entering another controller address, but got the same error message. I also opened PowerShell ran the following command to get additional information. Since this was a newer environment, I suspected that the Citrix Delivery Controller Machine accounts weren’t added to all the SQL servers in the Always-On Availability Group. 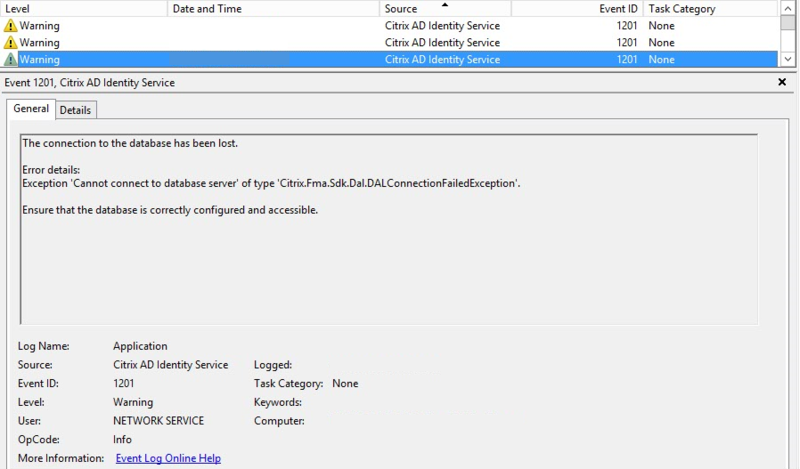 After checking with the SQL DBA’s, they had failed the databases over to do maintenance on one of the SQL servers and the machine accounts were not created on the new primary SQL server. As soon as they added the DDC Machine accounts, administrators were able to access studio.